What is 'frameless' versus 'face frame'? As the terms suggest, a face frame cabinet has a face frame, a frameless cabinet does not. So what’s a face frame? It’s a frame attached to the front of a cabinet box that covers up the edges of the sheet material that the box is made of, usually plywood in a quality box. In a lesser quality box, that material might be medium density fiberboard (mdf) or particle board. In those cases, the sheet materials are often thinner so the frame also serves to add strength. A quality frameless cabinet will be made of cabinet grade plywood, at least 5/8″ thick (we primarily use 3/4″) and faced with a veneer species according to the project specifications. It will often also contain additional internal structural elements. All exposed edges are covered with edgebanding to match the face veneer. European overlay, frameless overlay or simply, frameless are terms that are generally used interchangeably. This style of cabinetry consists of a frameless box with doors and drawer fronts that overlay, or cover the front edges of the box. It is a style that is popular in Europe and can result in a clean, modern, even high-tech look. These cabinets look best when tight tolerances between the doors and drawer fronts are maintained, generally between 1/16″ and 1/8″. 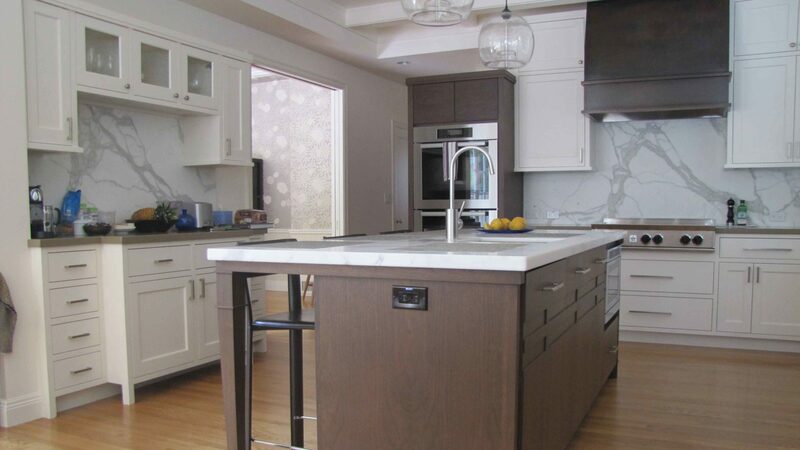 The practical advantages of frameless cabinetry are reduced cost (versus flush inset) and maximum storage space. Flush inset cabinetry begins with a face framed box. Doors and drawers are set into the cabinet frame so that they are flush with the face frame, resulting in a clean, classic look. The disadvantages of this style of cabinetry are cost and the sacrifice of a little storage capacity. Maintaining the tolerances required to achieve a clean, consistent gap around doors and drawer fronts requires the highest level of craftsmanship, making these more costly to produce than other styles. Face frames slightly reduce the width of cabinet openings, limiting access to spaces behind doors and requiring drawers to be narrower; insetting doors and drawer fronts reduces the effective depth of cabinets by the thickness of those doors and fronts. Those disadvantages aside, nothing rivals flush inset cabinetry for the look and feel of traditional fine furniture. What is 'face frame overlay'? Face frame overlay cabinets have their doors and drawers set such that they overlay, or lay on the surface of, the face frames when closed. Doors and drawer fronts generally overlap the face frames from 3/8” to 3/4”, and the gaps between the fronts usually range from 1/2” to 1 1/4”. These larger gaps relax the fit and assembly tolerances for this style of cabinetry, thereby reducing production cost, establishing economy as this cabinet type’s primary advantage. A disadvantage of face frame cabinets is the loss of storage access and capacity due to the width of the frames. Face frame overlay may be the most common cabinetry style available, found in ‘big box’ home improvement centers, local lumberyards or online. They can be purchased fully assembled, ready to install or ‘flat-packed’ requiring assembly once you have them home. This is the least common style of cabinetry we fabricate at Fine Line Joinery. Honestly, we simply can’t compete with the economies of scale that the big factories enjoy. Sometimes, however, we are contacted by customers in need of unique, custom solutions that can’t be found in standard catalog offerings, and we are happy to work with them to find those solutions and provide them in a style that matches their project.